Throughout most of 19th and 20th Century, Tremont was a multi-ethnic stew. Settled in the 1840s by New England Puritans, the neighborhood soon became home to immigrant Germans, Greeks, Irish, Poles, Ruthenians, Slovaks and Syrians. Most of these groups built their own houses of worship, giving South Side (as Tremont was long referred to) one of the greatest concentrations of churches in America. Later in the century, some of these structures were repurposed to serve later-arriving populations such as African-Americans and Hispanics. 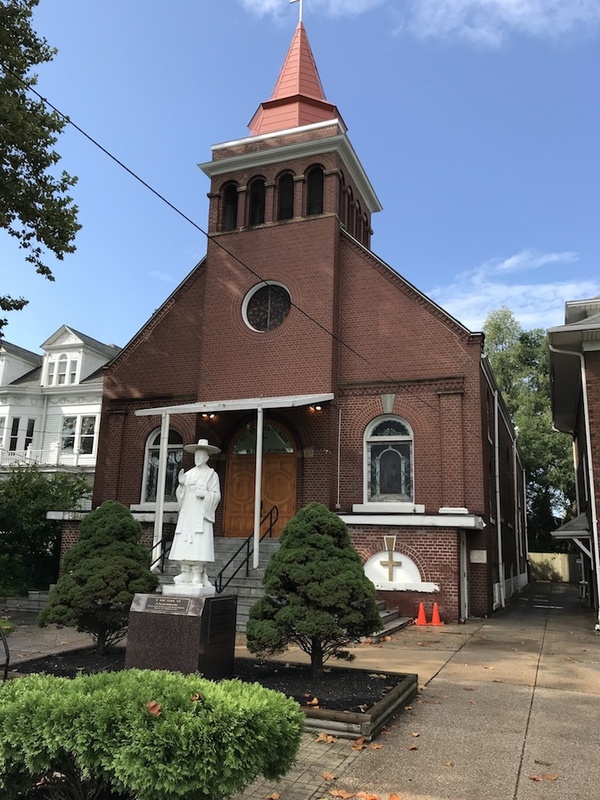 And although Korean Catholics were never a significant part of Tremont’s residential mix, they too have a repurposed house of worship: Saint Andrew Kim Korean Catholic Church at 2310 West 14th Street. “Korean Catholic” is actually a far larger faction than one might think—in Korea as well as America. Introduced by scholars who visited China and brought back Western books translated into Chinese, Roman Catholicism began to take root in the early to mid 18th century. The first Catholic missionaries arrived in Korea in 1836. St. Andrew Kim Taegon, the first Korean priest and Korea’s patron saint, was ordained in China in 1845. He returned to Korea at age 25 and almost immediately was arrested and beheaded by officials of the ruling Joseon dynasty which had banned Catholicism (the state-mandated religion was Confucianism). Religious freedom came to Korea in 1883. 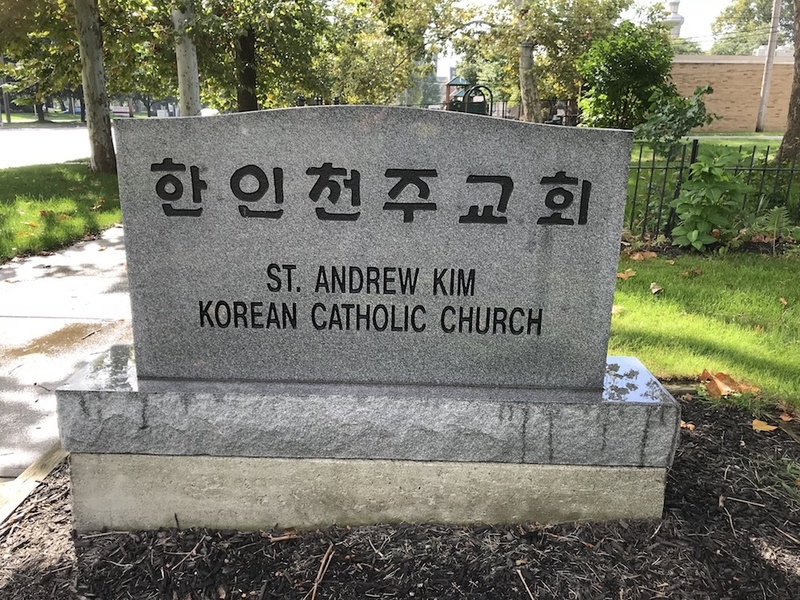 The Cleveland congregation known as Saint Andrew Kim Korean Catholic Church was launched in 1978 in the basement chapel of St. Ann Church in Cleveland Heights. 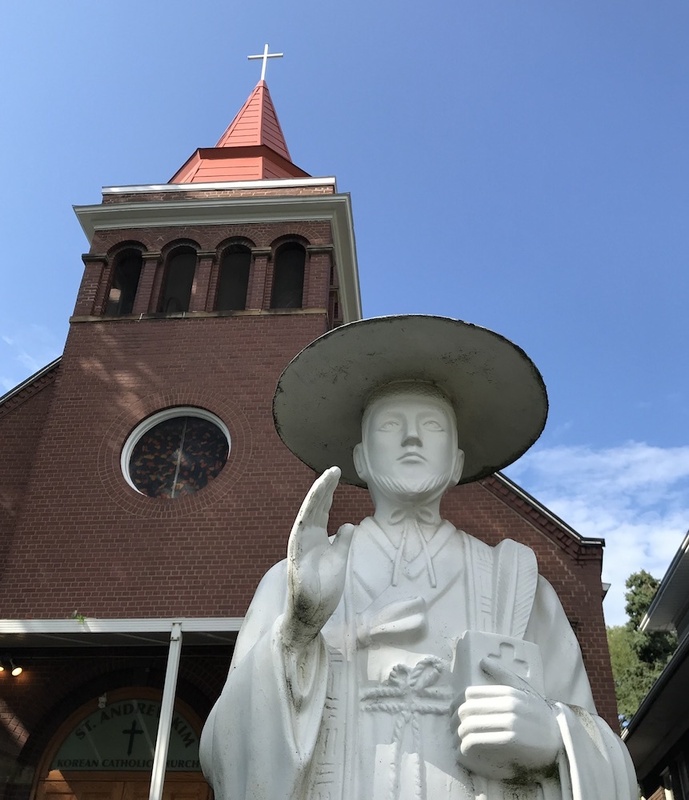 A year later, Father Francis Kwang Nam Kim, a priest from the Scranton, PA, Catholic Diocese, formally established the Cleveland Korean Catholic community. As the community grew, a larger space became necessary and an unused school building belonging to St. Augustine Parish in Tremont filled the bill. The structure’s classrooms were converted into a chapel. This arrangement lasted until 1988, when the community purchased its own church and rectory less than a quarter mile to the north. The object of this particular repurposing was the former Polish National Church, Sacred Heart of Jesus. Congregants of this church first assembled in a long-gone hall at the corner of Fairfield Avenue and West 11th Street in 1913. Two years later, three buildings were acquired on the east side of West 14th but financial obligations associated with the site were too great. Finally, in November 1916, the congregation purchased another site on the west side of West 14th and built the church building that stands to this day. Polish congregants worshipped in the structure until the mid-1980s when the facility closed. On behalf of St. Andrew Kim, the Catholic Diocese took control of the church on October 1, 1987. The Cleveland area’s only remaining Polish National Churches are now Holy Trinity on Broadway Avenue and St. Mary’s on Broadview Road. St. Andrew Kim Korean Catholic Church has become a spiritual epicenter for Korean Catholics throughout northeastern Ohio. The church offers mass in Korean and English, helps Korean immigrants adjust to life in the US and organizes religious lectures and retreats. In 1996, the Korean Catholic community received a relic of St. Tae Gon Kim. On August 24, 1997, the parish welcomed Bishop Anthony M. Pilla who celebrated Mass and formally unveiled a statue of the parish’s patron saint. 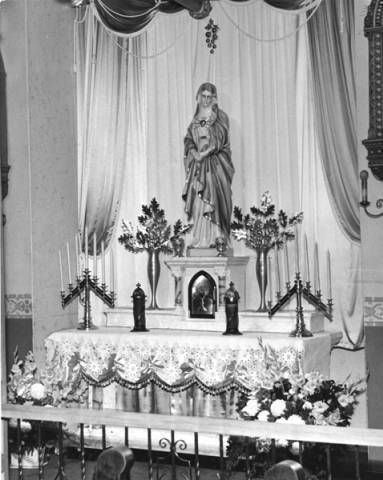 Previous altarpiece: From 1916 until the mid 1980s, the house of worship at 2310 West 14th Street was the Polish National Church, Sacred Heart of Jesus. 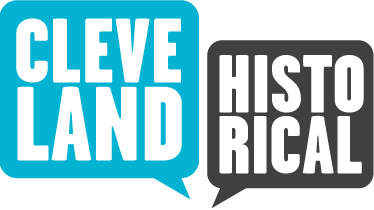 Chris Roy and Eileen Sotek, “Saint Andrew Kim Korean Catholic Church,” Cleveland Historical, accessed April 23, 2019, https://clevelandhistorical.org/items/show/850. Published on Oct 8, 2018. Last updated on Oct 18, 2018.